Some weddings are about love and some about fun. Sometimes they are about both and this was the case with Marie & Scott. The wedding began at the bright yellow Victorian classic Windermere Hotel, where the sisters enjoyed getting ready and putting the final touches to the hair and make-up that was beautifully done by Vintage Glam. 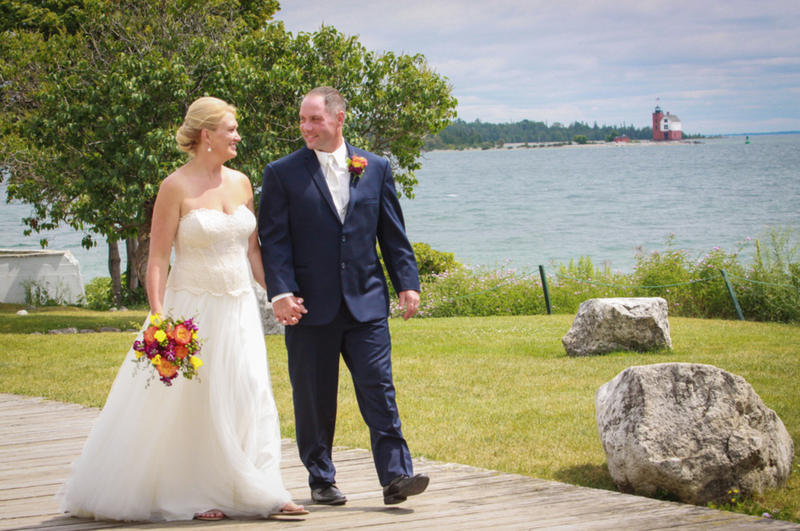 The wedding, expertly coordinated by For the Love of Mackinac's Carole Erbel, started off with a bit of rain and overcast skies, but by the time the carriage arrived at the Somewhere in Time Gazebo, the sun was breaking through and the wedding day was completely underway. Music by the Mike Davis Trio kept the pre-ceremony lively and enjoyable, and when Minister Marie Hulett began, the tears and laughter began to flow. Following the sand ceremony, the bride and groom arranged for each and every family or couple to have a photo taken with the beautiful bluff in the background. Guests would all receive a wedding frame and their photo at a later date. 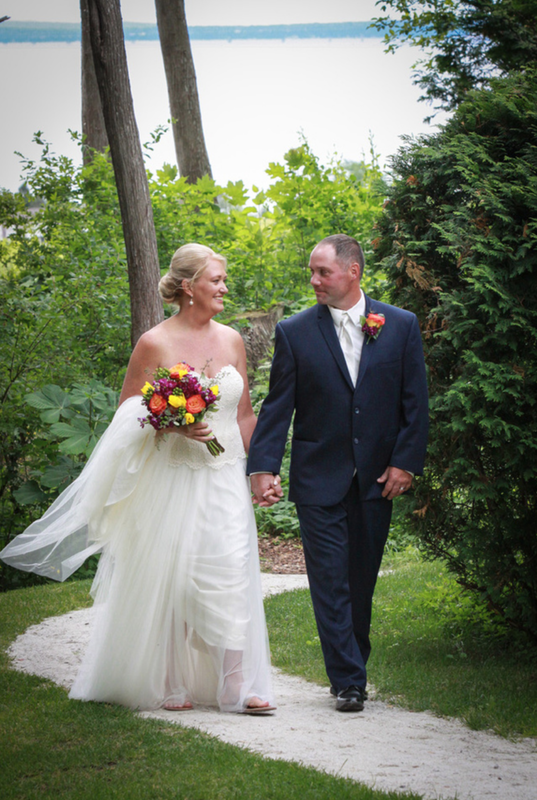 The beautiful Island House Hotel was the destination for the reception for Marie & Scott. Music again by the Davis trio, and gorgeous flowers and bouquets by Webers Floral & Gift. They were the perfect accessory to the reception and of course to the wedding cake too, created by Bella e Dolce. With the cake cut and toasts given, it was time to enjoy some heavy hors d'oeuvres with a Mexican theme, while guests mingled about enjoying laughs and each others company. To top off the fun, guests got casual and moved down Main Street to the Arnold Dock, where they boarded the Isle Royal Queen III by Sip N Sail, offering an intimate cruise for this crew of 25. Dancing, drinks, and a lot of photos of the Mighty Mackinac Bridge were the highlights of this festive gathering. Warm temperatures, and a beautiful sunset were a treat no one will ever forget.